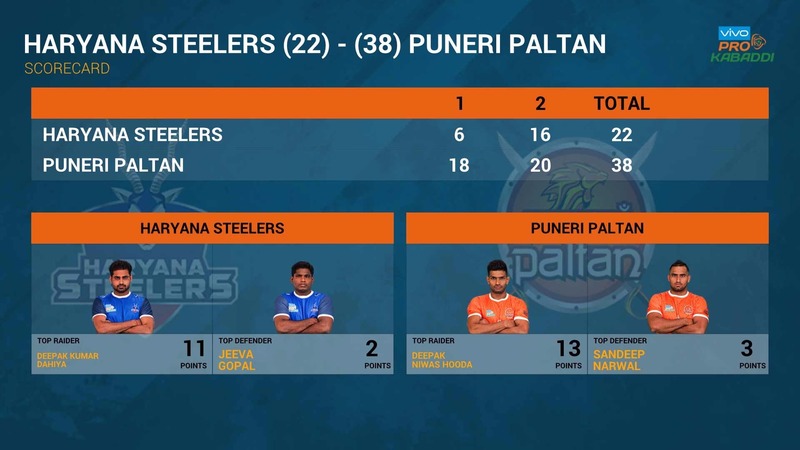 Puneri Paltan crushed hosts Haryana Steelers to register a mammoth 16-point win at the Motilal Nehru School of Sports in Sonepat on Wednesday. 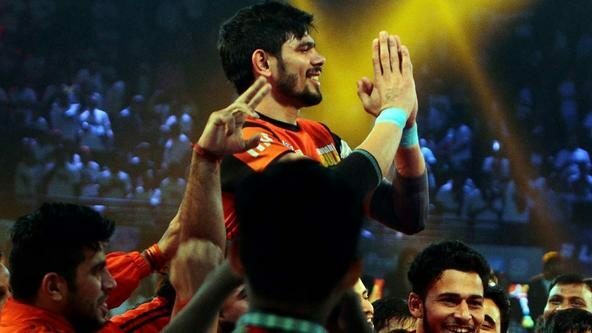 Captain Deepak Hooda was the star as he picked up his first Super 10 of the season to end with 13 points. He was aided brilliantly by Sandeep Narwal (8 points). Deepak Kumar Dahiya’s 11 points bore no fruit as the hosts suffered a 38-22 defeat. 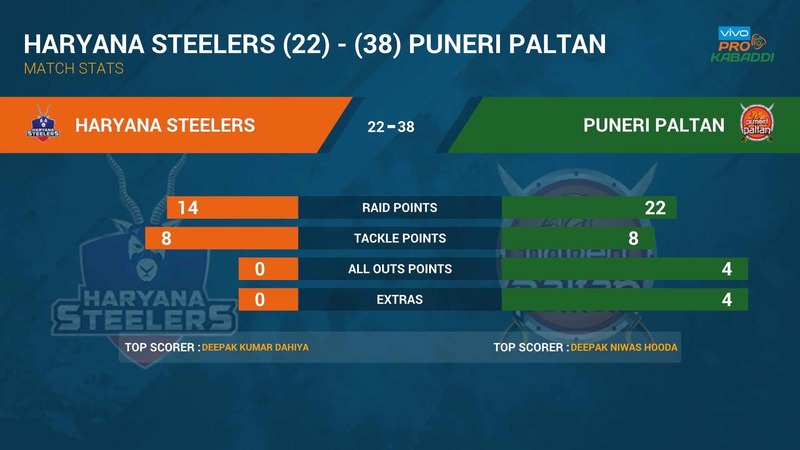 A couple of toe touches set the score ticking for both the teams before Puneri Paltan unleashed their inner beast to rise from the ashes of their last-match defeat. From the fifth minute onwards, a series of do-or-die raids started with Pune not giving Haryana any room to score for almost 8 minutes. 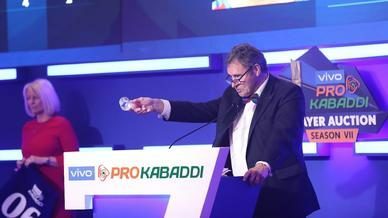 With Haryana’s defence failing miserably and Pune going all out, the home team crashed to their first All-Out of the match in the 9th minute to give Pune an 11-1 lead. Until the 15th minute, Haryana had no tackle points to their name but arguably the best defensive unit in the league came back strongly to pull off two super tackles within two minutes to reduce the gap. Despite that, the home team entered the breather trailing 6-18. Haryana started the second half with intent with plans of sticking to their defensive prowess and attacking only in the do-or-die raids. This led to their inflicting two super tackles on Pune in the first five minutes of the half to narrow the gap to 8 points. 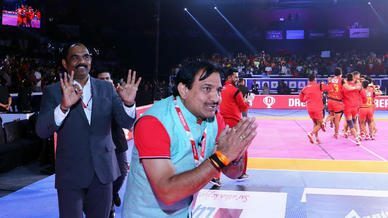 However, Hooda was in no mood to allow Haryana an effective comeback as he pulled off two consecutive two-point raids in do-or-die situations to put the home team into deeper waters. 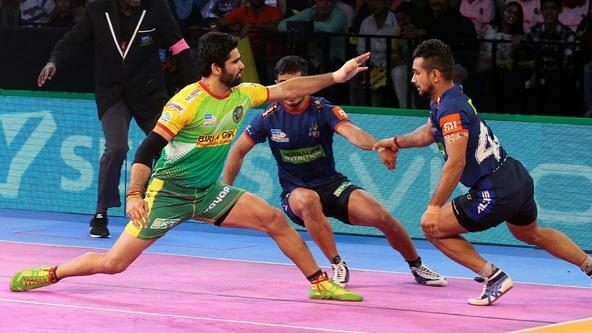 Haryana soon succumbed to their second All-Out of the match in the 37th minute and appeared to have lost their steam as the scoreline read 31-19 in Pune’s favour. Even after picking up his first Super 10 of the season, Hooda continued his annihilation and initiated a super raid in the dying seconds of the match to help his team win comfortably 38-22.